On a personal note from us to you: We are dog people as well. We are proudly owned by them. Never ever a harder day than the moment they moved on - WE DO UNDERSTAND. Use the contact seller email to send us the info you would like. This 12" x 6" x 3/8" piece of Granite is engraved with an image of an Alaskan Malamute and a rose as shown. 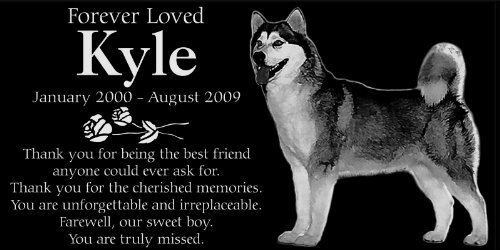 The personalized text (you can have whatever you like), as a default, we have: "Forever Loved and Remembered" Name of your dog, date of birth and passing, and "Thank you for being the best friend anyone could ever ask for. Thank you for the cherished memories. You are unforgettable and irreplaceable. Farewell, our sweet boy. You are truly missed." Thank you very much for your purchase and allowing us to help. This piece of Frosted Engraved Granite measures 12 inches x 6 inches and a thick 3/8ths inches in depth. The black, natural stone tile is polished with a smooth surface and a high sheen. Being a natural product, which means there can be variations in color and pattern, and sometimes what you get delivered may be touch different than what you see in the display but as in nature all is most acceptable. NOT TO WORRY, WE EMAIL YOU SAME DAY THE ORDER IS PLACED FOR YOUR PET'S DETAILS. Or after you purchase, use the contact seller option on "Your Orders" page to send us the information (words) you would like. Custom engraved 12 x 6 inch granite Pet Memorial. Weather proof granite engraving, suitable for years of outdoor use. Design is fully customizable. We will Custom Design and send for your approval. If you have any questions about this product by Lazzari Collections, contact us by completing and submitting the form below. If you are looking for a specif part number, please include it with your message.